This book provides stunning new information about the glass factories of Riesengebirge and Isergebirge. These regions are today in the border area between the Czech Republic and Poland. The author, Marek Kordasiewicz, shows us evidence and documentation to establish that these factories were engaged in the manufacture of millefiori as early as 1833. This is before the French factories started making millefiori paperweights. Marek suggests that perhaps these factories played a greater role in the development of the art than is currently acknowledged. In the past, paperweight collectors identified paperweights from this region as simply Bohemian. More correctly, the glassworks were located in Prussia, Austria, Poland, and the Czech Republic. 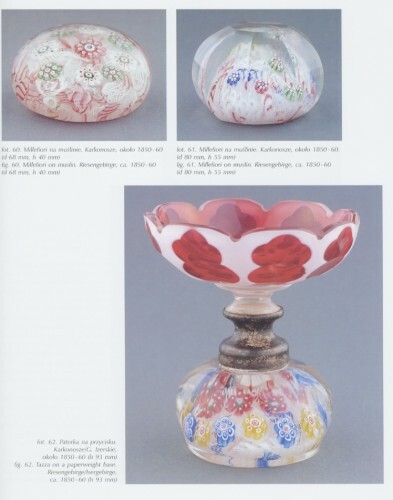 The author gives us a geography lesson and sheds new light on the history of glass paperweight production and the role of the 19th century Lower Silesian glassworks in the development of this art. 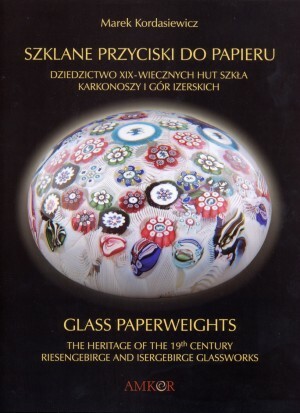 Included is new information about the early paperweights, their origin, and the possible influence of the "Bohemian - Silesian" paperweights on the classic period paperweights from French, English and Russian glassworks. To further illustrate the depth of the achievements by the factories of this region, the author at times makes comparisons to the outstanding American millefiori paperweights made by Drew Ebelhare. He suggests that only now, fifty years after the start of 20th century paperweight renaissance, has the art advanced to the point where it compares favorably with the best weights from Riesengebirge and Isergebirge. This book does an outstanding job in presenting the full beauty of paperweights from Riesengebirge and Isergebirge. It is full of wonderful pictures and is an essential book for any serious collector of glass paperweights. The book is the first paperweight book published in Poland. 119 pages with over 200 color photographs. In English and Polish. Hard bound. 9" by 11 3/4". 2002. Each section includes an extensive bibliography.